Legal news for product liability attorneys – A Maryland company recalled its 3.5 oz. jars of Black Pepper Double Gold Fish due to possible Salmonella contamination. Possible Salmonella contamination prompted recall for 11 states. Cheverly, MD (www.NewYorkInjuryNews.com) – MY-A & CO. of Cheverly, MD, issued a recall of 3.5 oz. jars of Ground Black Pepper Double Golden Fish due to the risk they may be contaminated with Salmonella, as reported by the U.S. Food and Drug Administration, (FDA) www.fda.gov. The FDA press release was issued Wednesday, April 14, 2010. The Salmonella contamination was found in several of the jars during a routine inspection by the New York Department of Agriculture. The product comes in a 3.5 oz. plastic jar with no product codes. The product was distributed to retail stores in Georgia, Texas, Illinois, Maryland, Virginia, North Carolina, Ohio, New York, Massachusetts, Maine and Florida. Salmonella is an organism which can cause serious and sometimes lethal infections, particularly in young children, frail and/or elderly persons and others with weakened immune systems. Symptoms include fever, diarrhea, stomach aches and nausea. In rare situations, Salmonella infections can result in the organism entering the bloodstream, which can produce severe illnesses such as arterial infections, endocarditis and arthritis. Those who purchased the 3.5 oz. 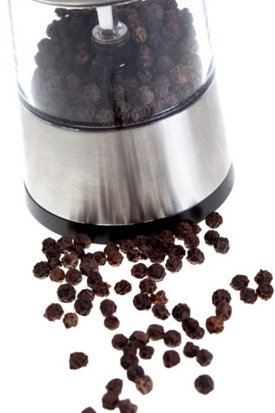 jars of pepper are recommended to return the product to the place of purchase for a full refund. Any questions with regards to the recall should be directed to MY-A & CO at (301) 322-1237. Representative Jessica Moynihan will be made available for inquiries.